The Grand Finale. Oh what a party! Olympic Athletes. 54-40 giving a whole rock concert. Gold Medal Pints beers. Superb wines… And yes, there would be something to eat – the signature dishes of each of our 11 champion chefs. Whichever one of them took gold tonight would receive a spectacular prize – a trip to a cocoa estate in Africa or South America courtesy of Cacao Barry, the great French chocolate company. The judges returned to their sequestered space to await the arrival of the dishes. Unlike at the Mystery Wine Challenge, however, we knew who cooked what, for each chef came in with his or her dish and gave us the details, answering our most penetrating questions with calm applomb. We began with Chef Mike Robins of Sous Sol in Winnipeg. Like all our competitors this year, reprised the dish that had won him the gold medal in his home town. At its heart was a perfectly seared Nova Scotia scallop – so simple, so delicious, so hard to time for 600 people. The rest of the elements on his plate were anything but simple. 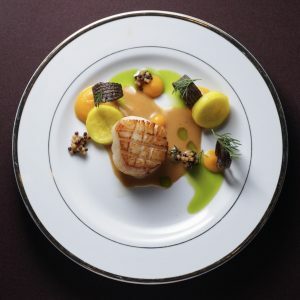 Headlining in terms of umami-saturated flavour was a superb sauce – a beurre blanc made from a dashi broth and enriched with miso, Chef’s homemade Dijon-style mustard, lemon, wine and the liquor from the raw scallops. Button-sized slices of zucchini, pickled in apple cider and cider vinegar flavoured with turmeric and mustard, stood upon dots of puréed carrot. A half teaspoonful of pickled mustard seed was carefully judged – not too tangy – while fresh dill fronds and a cool herb oil made with sorrel, dill and chives brought a little chlorophyl to the party. Potato also featured, but in a most unexpected way. They had been put through a Chinese turning slicer, emerging like string, which Chef dyed black with cuttlefish ink, wrapped around a canoli tube and then deep fried into crispy spirals. The wine match was inspired – the bright, complex 2015 Tantalus Riesling from the hilltop that overlooks Kelowna. Chef Alex Chen from Boulevard Kitchen & Oyster Bar in Vancouver was the next to appear. 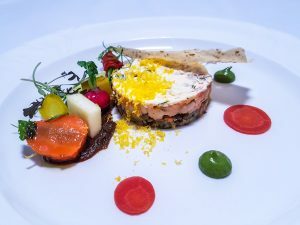 He chose to create his dish inside an empty tin of Northern Divine caviar which he set on a bed of seaweed at the centre of the competition plate. Inside the tin was a treasure trove of wild B.C. shellfish meticulously set in a rich custardy chowder which was then topped with a translucent layer of golden gelee. “It’s all about umami and fun,” explained Chef Chen. That gelee was made from a stock of geoduck and sturgeon bones, the natural colagen causing it to set. 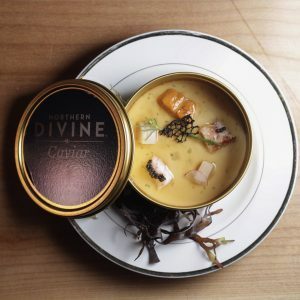 Chef chose five kinds of shellfish – Dungeness crab, horse clam, side stripe shrimp, geoduck clam and sea urchin – and topped three of them with a little Northern Divine sturgeon caviar. He finished the dish with an ethereal coral cracker dyed black and flavoured with squid ink and a small green sponge of brioche that used clam juice and bull kelp. So labour intensive! But so delicious! Chef’s wine choice was excellent and provided a cleansing acidity to all the rich, umami pleasures of the food – the light, tangy, suavely aromatic 2016 Ortega from Sea Star on Pender Island. Come on in Chef Lorenzo Loseto of George in Toronto. 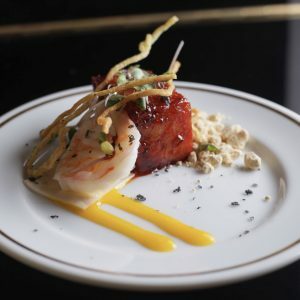 The principal element of his dish was a rectangular runway of toothsome, tender lentils, about a quarter of an inch high, spread with a sort of tartare made of lightly poached lobster chopped into a lemongrass mayo. The flavours of lobster and of lentil were notably vivid and bright and they went together delightfully well, enriched by a golden sprinkling of egg yolk that had been smoked, cured, dehydrated and finely grated over the dish. Lying across this soft, layered almost-terrine was an ethereally crisp anise wafer; beside it was a gathering of colourful vegetables. Heirloom carrots were presented in diverse ways – an orange one roasted in a little parsley oil until it was soft and sweet; a yellow one treated the same way but cut into slightly firmer dice; a red one sliced into a ribbon and rolled around a bundle of juicy chives (less than an inch long it was almost too cute to eat). There were crunchy rings of fennel and a scattering of fennel sprouts to echo the anise in the wafer, while a square of fresh fuji apple echoed dots of bright green, intensely flavourful apple jelly. 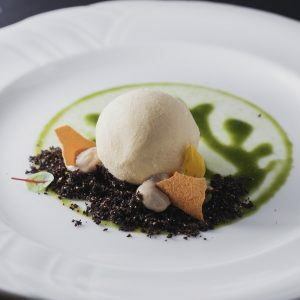 A rich black garlic purée served as a sauce. It was the sort of composition Chef Loseto often creates at George – symphonic but never confused, with its own intricate harmonies working themselves out like a fugue of flavour on the tongue. Again, we were treated to an exceptional match with Chef’s choice of wine, the 2015 Chardonnay called ‘The Fifty’ from Leaning Post Wines in Niagara. Barrel-fermented but aged in steel, it offered rich texture but clean, unoaked aromatics, working equally well with the lobster and lemongrass and the earthy sweetness of the carrots. Chef David Vinoya of Wild Sage Kitchen & Bar in Regina came in next. He called his sensationally beautiful dish The Nest and it turned out to be a most imaginative play on a theme of chicken. He began by creating an abstract circular pattern of emerald green watercress fluid gel that had a fleetingly sweet, herbal flavour. Powdered black olive added interesting saltiness to a mound of beetroot soil that was edged by two tiny areas of very rich, chilled chicken liver mousse. Into each of these Chef stuck a fragile little fin of chicken tuile, made by roasting and puréeing chicken, adding flour and isomalt and then dehydrating it into a crisp. Wee leaves of red-veined sorrel and star-like edible yellow flowers prettified the creation but the main event was a pale sphere, like an egg, rising mysteriously from the soil. And egg it was… Chef had cured eggs in the manner of the Philippines by soaking them in mud and salt for 30 days; then he turned the yolks into a firm, super-smooth ice cream. You might expect a touch of umami in the flavour of eggs treated this way but the final taste was of rich, custardy yolk and an almost caramel-like sweetness. Chef finished the dish by holding a catkin over the plate and tapping it so that the pollen fell like fine dust onto the egg. “It’s quite flavourless,” he explained, “but packed with nutrients and minerals, so this dish is good for you as well as delicious.” The chosen wine worked really well with the subtle, pervasive sweetness of the dish – a bubbly for which I have a particularly soft spot, and which has taken other chefs to gold in the past – Benjamin Bridge’s exotic, Muscat-scented Nova 7 sparkling wine from Nova Scotia. Chef Briana Kim of Café My House in Ottawa was our fifth competitor, boldly presenting the vegan dish that triumphed for her in Ottawa. Its main event was a cremini mushroom panade that was given a meaty texture by a complicated process that involves baking, dehydrating and sous-viding the ‘shrooms. The panade is then marinated in miso butter and lightly seared. Chef Kim topped it with some whole smoked mushrooms, leaves of charred cabbage the size of large postage stamps, petals of pearl onion, and sweet, crunchy balls of Asian pear. 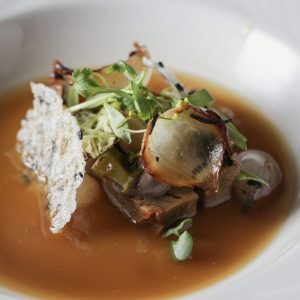 Portobello mousse added richness and the flavours were all brought together by a piping hot broth scented with Kombu and charred onion that Chef poured into the bowl. Micro greens added bright colour and resting across the bowl was a long crisp made from rice studded with fennel, black sesame and coriander. Her choice of beverage was the delightful, fruity, forthright Izumi of the North Junmai Genshu sake from the Ontario Spring Water Sake Company in Toronto – a wonderful match. Chef Shane Chartrand of Sage in Edmonton was our next champion. 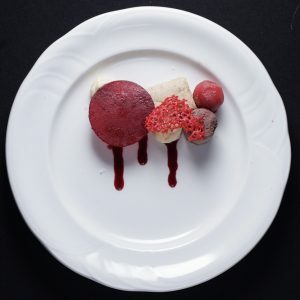 His dish was a visual stunner that he entitled “The Effects of Red.” He began the plating by putting three pools of wildflower honey and huckleberry sauce onto the plate; then he turned the plate on its edge so the droplets of sauce became red streaks a few inches long. Then came larger dots of a rich and tasty almond-and-parsnip purée, and a scarlet ball of red-wine-poached pear. Against these rooty, fruity background flavours he set his two proteins – a slice of a dense but juicy terrine of pheasant breast enriched with pork neck fat, and beside it a wee drum of foie gras torchon, sprayed with a mixture of beet juice and cognac to perpetuate the “red” theme. The finishing touch was a shard of red coral as crisp as melba toast, made by frying a watery batter on a very hot surface. 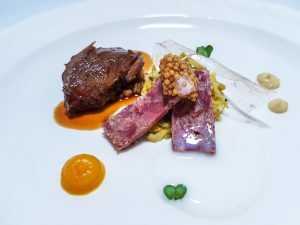 Chef’s wine match did not let the side down – indeed, he explained that he had started conceiving of his dish with the wine already chosen: the 2015 Tantalus Pinot Noir. Chef Barry Mooney of Gio in Halifax now entered the room. 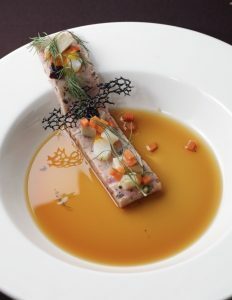 His dish also looked spectacular – a slim slice of ham hock terrine, draped elegantly from the rim of the bowl down into its centre, crowned with all sorts of treasures. Chef finished the dish at the judges’ table, pouring on a warm, golden smoked pork consommé with a marvellously meaty fragrance. It had the happy effect of loosening the texture of the terrine and releasing its flavours. Meanwhile we were busy exploring the other elements of the dish. Chef might have merely chopped up a scallop to include as a garnish; instead he puréed it with lemon zest and parsley then poached it sous vide. Then he chopped it up and included morsels of it on the terrine runway. Beside it were tiny bricks of foie gras mousse, a brunoise of lightly pickled carrot, miniature sheets of haskap jelly, dots of carrot purée and a garnish of fennel fronds. The final flourish was a crunchy lacework tuile of squid-ink batter adding crunch and salty umami to the delicious creation. Chef’s chosen wine was a clever accompaniment – bright, minerally but not too aggressive, the sparklingly sophisticated NV Brut Rosé from Benjamin Bridge in Nova Scotia’s Gaspereau Valley. Chef Éric Gonzalez of L’Atelier de Joël Robuchon in Montreal was our eighth competitor. 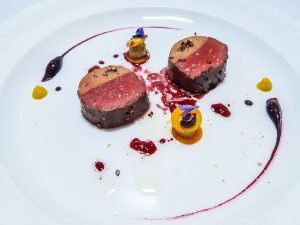 He traced two comets of haskap berry and blackberry coulis around the edge of the plate to paint a perfect purple circle in the centre of the plate, each one chasing a small mound of squash purée and a dot of black truffle paste. Closer to the centre, like two tiny yellow satellites, were sculptures formed of two dime-sized circles of marinated butternut squash joined to each other by dots of chestnut purée and topped with a minute, bright blue flower petal. The twin suns around which these elements spun were two drum-shaped slices of protein, half of it made of quivering foie gras, the other half superlatively tender Alberta bison loin. Chef had joined the two meats together with protein, rolled them into a cylinder like a torchon, and cooked them sous vide, a technique he understands as well as anyone on the planet. Coarsely ground pepper and a freckling of gold leaf added further riches. The wine that accompanied this little masterpiece was the 2013 Syrah from Painted Rock in B.C. – a powerful, intense beautywith a nose of ripe black cherries and anise. Chef had tuned his berry coulis to precisely the same frequency. Enter Chef Nick Jewczyk from The Fifth Ticket in St. John’s accompanied by our gallant food runners. Everything on the plates they carried was delicious and harmonious. At stage left Chef had placed a slice of beef cheek, moist, tender, first seared then confited in beef fat. It tasted spectacularly meaty, sharing a little of its black garlic demi-glace with the nicely chewy wheat berries that lay beneath. The second protein was two slices of smoked beef tongue, silky and delectable, and the third was bluefin tuna – not as a piece of fish but as dabs of a tonnato sauce. Veal tonnato happens to be one of my favourite dishes; I now know that smoked tongue with tonnato sauce is every bit as scrumptious. That tongue was placed on a heap of tangy, lightly fermented “sauerkraut” made from Brussels sprouts and was topped with onion foam and half a teaspoonful of grainy mustard. Dots of yellow squash purée added further colour and the coup de grace was a translucent crisp of potato glass that tasted precisely of fried potato. Chef’s chosen bevvy was a very refreshing and welcome brown ale called Alli’s Big Brown Ale from the Split Rock Brewing Co. in Twillingate, Newfoundland – a natural match for the braised beef cheek. Our penultimate plate came from Chef Blake Flann of BLAKE in Canmore. Alone this evening, it acknowledged the coming winter Olympiad in South Korea with a gojuchang-lacquered briquette of pork belly. The surface was crisply crusted with the sweet heat of the glaze, the flesh and fat inside succulent, melting and packed with flavour. The belly sat on a sheet of “prawn paper” – firm prawn mousseline flavoured with garlic butter and thinly sliced – that also supported chunks of tart pickled raw prawn. More acid kicked in from yuzu juice pearls and there was crunch from crisp, nori-dusted ramen noodles to add to the fun. As a sauce that worked equally well with the prawn and the pork, chef gave us egg yolk, slightly cooked but still runny. Then he mounded peanut powder crumble beside the belly and dropped two or three microgreens on top. The wine match was right out of left field, a dry, refreshing 2016 Pinot Meunier called ‘Bo-Teek’ from Vineland Estates in Niagara. Its fresh acidity and minerality stood up to the gojuchang delectably well. Chef James McFarland of the University of Saskatchewan in Saskatoon gave us the final dish of the competition. His delectable protein was a tenderloin of bison, wet-cured in espresso coffee and smoked salt, air-dried, marinated in a spiced smokey espresso paste, cooked sous vide and finally flashed in a brown butter sear. A long process but the meat was marvellously tender and flavourful. On top of it was more bison – the flank, marinated in fish sauce and soy then shredded, crisped and infused with birch syrup vinaigrette. It had a powerful woodsy, ashy flavour that contrasted beautifully with the moist tenderloin. The accompaniments were more like condiments than sides – dots of french onion essence enriched with comté cheese and fish sauce; tangy petals of pickled pearl onion; a smoked corn purée and a dusting of smoked corn powder. Black currant appeared as a tart gastrique and an ethereal coral tuile. It all looked splendid and tasted delicious, especially when one piled several elements onto the fork. 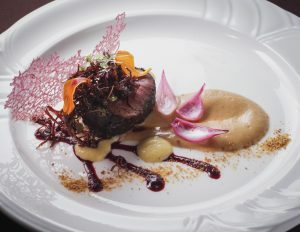 The wine Chef chose was superb and so was its relationship to the dish, bringing coffee and black currant notes into play – the 2013 Grand Vin from Osoyoos LaRose in the Okanagan. And so the eating was over. It only remained to enter each judge’s scores into the master program. Our two front runners had not stumbled. Chef Barry Mooney won bronze by a hair’s breadth. Chef Éric Gonzalez took the silver medal. 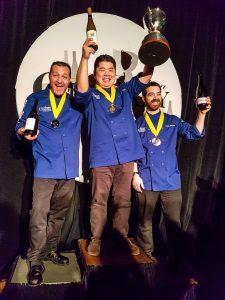 And Chef Alex Chen, to the thunderous delight of the BC crowd, won the gold. He had taken first place in each of the three competitions, working with extraordinary intensity and his victory was very well-deserved. Congratulations to all 11 chefs, to their sous chefs and teams, to the hard-working judges and to the brilliant Gold Medal Plates team that makes the entire weekend pass as smoothly as Alex Chen’s chowder. And huge thanks to Deon Nel Photography for all these images. I could not find your email address so am using this medium to comment on your Pisco Sour recipe that is online at the LCBO website. I was born and raised in Peru, so can tell you that it is wrong to use a blender for a Pisco Sour. The recipe I learned as a boy was: 1, 2, 3,4: 1 ounce of lime juice, 2 ounces of simple syrup, 3 ounces of pisco, 4 ice cubes; add the white of one egg and shake until foamy; strain into 2 glasses and top with 3 drops of Angostura bitters. (In the South of Peru they sprinkle cinnamon on top). Thank you very much, Mr Spence. I shall have fun exploring your recipe. It sounds delicious.